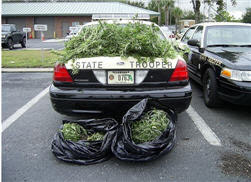 The Florida Highway Patrol has found approximately 60 pounds of marijuana on Interstate 4 and are asking anyone who knows about it to give them a ring. The two large garbage bags full of marijuana plants, valued at over $54,000.00 apparently fell out or were thrown out of a passing vehicle, Trooper Larry Coggins said. It was found in the area of McIntosh Road near Tampa, just east of Interstate 75. The press release asks, "Anyone missing their bags of marijuana or knows how these bags made their way onto the interstate system is asked to contact the Florida Highway Patrol at 813-631-4020." Sure guys, go right in and pick it up. The FHP will give you a bonus too!